Chinese style fried rice- Fragrant aromatic rice stir fried in Chinese style with a selection of crisp vegetable and flavoured with Soya sauce it makes a lovely lunch dish. 1. In a wok heat the oil and fry the cashew nuts. 2. Remove cashew nuts and drain on kitchen paper. 4. Add the rice, salt and chilli sauce and Soya sauce. Toss (not stir as this will break the rice grains) till rice and vegetables are mixed and rice is heated through. 5. 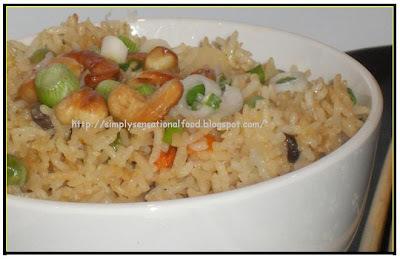 Transfer rice to serving dish and garnish with spring onions and fried cashew nuts. Sweet and sour sesame vegetables. Fried rice looks really nice. hey..u know had made it yesterday only..next time wl try ur version..
Fried rice with baby corn and chestnuts are really a delight! 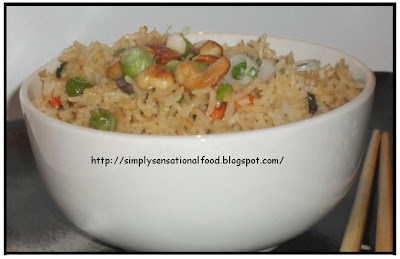 Fried rice is my favourite too, yours looks delicious and healthy with addition of veggies. Fried rice is my favourite. Your Veg fried lice looks so good that taking a cue from your recipe I would prepare it today for dinner..
What a yummy bowl of happiness that is????? It's lovely...You have prepared it so so so welll & presented it more so than that....& captured it so so so much more than that....to make us all envy of you.... I bet! I would love to taste a spoon.... How I wish we could swap or exchange what we prepared too.....!!!!!!!! I guess, this is loved by all...my family's fav too :-) Looks perfect and tempting ! I love chinese food and fried rice looks yummy and mouthwatering. fried rice looks simple, delicious and comforting dear !!! I love it!! Adding those nuts is something new to me,sounds great! Wow! what a tempting recipe! Most of the time I would be cooking a quick fried rice for my lunch! Never thought of adding nuts in them! I would definitely do so from now on.